OSAYIMWEN OSAHON GEORGE investigates some of the numerous challenges of tenants living in the commercial capital of Nigeria, Lagos State where the hustle for limited resources is intense. Lagosians living in rented apartments always have unique experiences that could crack your ribs if chronologically discussed over some profusely sweaty bottles of beer at a cosy bar watching an Arsenal FC match against a lesser team like Crystal Palace. The initial drama begins when you are searching for an apartment which will entail contacting an Estate Agent who is mostly doing the work unprofessionally as a ‘side hustle’ to augment his income. To cut losses and maximize gains, he will demand you register with him by handing over a photocopied bio-data form to you. The form costs about N5,000 or less depending on your bargaining power popularly regarded as ‘Street Credibility’. The next step will be for him to take you on a tour round streets where there are available houses. The agents have a way of showing you houses a pig might vehemently refuse to stay if the opinion of the domestic animal is sought. The entire transport cost is on your head and some agents are barefaced enough to demand for refreshments from you to energize their bodies. No matter how congenial the agent seems to be, his personal interests are always placed ahead of his clients’ maximum utility. The reports gathered have shown that Estate Agents don’t really care about the comfort of the potential tenants. In most cases, they have no direct connections with the houses they show you; they end up being the unwanted third party between you and the direct agent. Their friendliness is a ploy to secure their cuts from the deal and move on with life while you solely carry your cross to Calvary. Abdullahi Yunusa in June, 2015 secretly laughed at a friend who unfortunately rented an apartment with a leaking roof for over half a million naira over a period of two years at the Ebute Metta area of Lagos State; little did he know was about to face the same ordeal in the next two years when he was ready to rent his own private apartment. 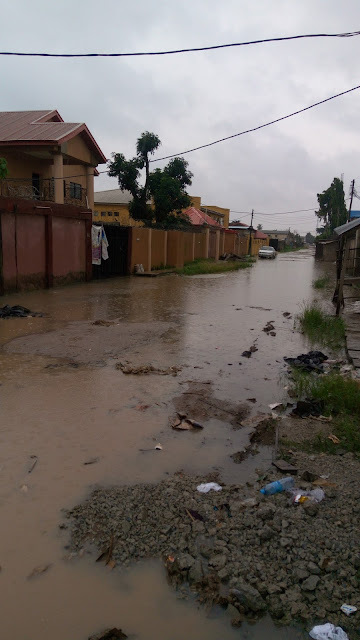 “Living in houses with leaking roofs is not strange in Lagos, a friend of mine living in the highbrow Lekki area used to strategically position numerous buckets within his house during the rainy season when heading out to work to prevent his properties from being damaged by water. He even had one big bowl on his bed. This might sound funny but it’s was serious” one Ayodele who relocated to Lagos from Abuja in 2012 told this journalist before the reportorial started. Yunusa, a young man of Northern extraction who was working in the FESTAC Town area, Amuwo Odofin Local Government Area, Lagos State was advised by his colleagues to rent an apartment at the not-too-far Ago Palace Way, Okota area of the Oshodi/Isolo LGA which was just a 15-minute ride to his office. He set out on a weekend towards the ending of June, 2017 to meet an Estate Agent – Mr. Wilson recommended to him by his colleague at work. Yunusa rang Mr. Wilson and fixed an appointment with him on a Saturday. After initially missing his way, Yunusa located his office at the Century area of Ago Palace Way. “My initial fear was paying money to a scammer as I have read similar cases of rent scams freely happening in Lagos. My fears were allayed when I met Wilson face to face at the corner he managed to regard as an office” Yunusa said. According to him, Mr. Wilson, a fair-complexioned man looked to be in his early fifties; he had a clean shave and was modestly dressed with documents occupying more spaces in his office than him who looked fairly chubby. Different clients thronged the office and called his mobile phone at regular intervals proving that his dealings were legitimate. From the first impression, part of his prayer points in church might be to secure a bigger and more sophisticated office, Yunusa teased. Anyway, he greeted Yunusa warmly and they discussed the kind of house he wanted as well as the possible rates. “My brother, as I see you so, I know the house wey you go like. This house go fit you. Light dey, water dey and na prepaid meter them dey use. In fact, no landlord wahala as the man nor dey stay the place. The place near road well well. You go like am” the agent boasted to a quiet Yunusa speaking in a local parlance – Pidgin English before the exploration started. After being shown some undesirable apartments, he settled for a small place at Harrison Sholaja Street, Ago Palace Way. The waterlogged nature of the road to the low-keyed apartment foretold he wasn't safe during the rainy season. He either needed a rain boot or probably needed swimming lessons to survive a dreaded flooding incident. The untarred road was so erosion-ridden that some unscrupulous residents secretly levelled it up with heaps of refuse in the middle of the night. He would later discover that the Estate Agent, an Edo man from the Ishan (Esan) part of the State who spoke with a clear South-south accent had no direct link to the apartment which had an Igbo man named Emmanuel (Surname withheld) in charge. Yunusa, a green pasture-seeker from Kaduna State, Northern part of Nigeria never believed the maxim that "Igbo people love money" until he spoke directly on phone with Emmanuel, a man of average height in his late thirties with protruding tummy probably from excess alcohol intake. The man according to Yunusa spoke like he stuffed a piece of bread in his mouth as he called ridiculous amounts of money causing him to tremble with fear. His rent was so astronomical that one would think he was aiming at the sky. "Mr. man, as you can see the house is a good house. The rent per year is N300,000 per year, Agent and Agreement Fee is N100,000 and the Caution Fee is N50,000. The entire cash for the one-bedroom mini flat is N450,000. No more no less" he concluded in a very conk Igbo accent. Yunusa, a struggling administrative officer at a printing company was stunned. The figures negated the ones provided by Mr. Wilson. He had earlier agreed on the regular rates which were N250,000 as the normal annual rent, N100,000 for the Agent & Agreement Fee and N30,000 as Caution Fee (a refundable amount to serve a cushioning effect in case the tenant destroys a part or parts of the apartment when he is ready to leave). He handed over the phone (calling cost on him) to Wilson who suspiciously swerved to a corner to secretly negotiate with Emmanuel. Moments later, the costs were normalized to suit the affordable rates budgeted for by Yunusa and he was made to speak to Emmanuel again for confirmation. "You know what, speak to my boy, Uche. He is with you. He will tell you what to do. I hope you are serious oh" Emmanuel told Yunusa on phone as they concluded. Dealing with Uche was another headache. Uche appeared to Yunusa like an everyday Nigerian youth supporting his life with petty internet scam. He almost wanted the rent that moment without wasting seconds. Yunusa who wanted to pay him in two days’ time, Monday urged him to be patient as he needed to withdraw the funds from the bank to prosecute the transaction. "Bros, people plenty on top this house oh. Make I nor lie you, person don come check am but him money nor complete na why we never give am. If you nor gimme the bar, the house don go be that" he said in persuasion against leaving empty-handed. He even advised Yunusa to make a down payment of N50,000 regarded as ‘Commitment Fee’ which Yunusa declined to do out of distrust. They exchanged numbers and parted ways. Yunusa took permission from his strict and busy office to make the payment on a raining Monday. On meeting Uche outside Emmanuel’s locked office at Cement Bustop, Ago Palace Way, he was told that the rent had been increased from the agreed N250,000 to N270,000 after due consultations with a fictitious landlord whose identity remains enigmatic till date. Drenched by the rain, Yunusa bit his finger his anguish and pulled the plug on the deal as he joined the next bus to his working place with a mind filled with regrets and anguish. In summary, Yunusa would later rent the house for the initial agreed price of N250,000 after Emmanuel’s worker bombarded his phones with incessant call to tender apologies. After the transaction was completed, the house keys were handed over to Yunusa. The receipt dated 14th of July, 2017 carried the N250,000 regular rent and the N30,000 Caution Fee but the N100,000 fund was Agent and Agreement Fee was never recorded. For the record, the major red flag of an illegal fee is the absence of proper documentation. In the spirit of fairness and truth, Yunusa explained to this journalist that the house was satisfactory as electricity supply was steady due to the usage of pre-paid meters which prevented customers and electricity distribution companies from cheating themselves. Water supply was to an extent adequate but the compound was too crowded. The sparse compound housed about 11 families and 5 single tenants of both gender living alone in two separate one-storey buildings and a Bois Quarters. Most of the apartments were one-bedroomed and two-bedroomed flats. The single guys chose the former while the married ones stuck with the latter. A major challenge was knowing who is who; in a place like Lagos where rent is exorbitant, a tenant with two rooms might house eight people or more on a temporary note. To get on the good books of neighbours, Yunusa simply cultivated the habit of greeting whosoever he met on his way in the compound pending on when he formerly met the real tenants at a general meeting of tenants and the caretaker, Emmanuel. Although Yunusa had sworn he wanted no room-mate as he planned to enjoy some private romantic sessions with his light-skinned girlfriend – Yinka; he was forced to deal with perpetual Lagos housemates like cockroaches and massive rats which could be considered for consumption in case of famine or civil war. According to his narration, the rats were daring and most times impatiently competed with tenants for the right of way. Yunusa’s apartment which was downstairs was at the mercy of the septic tanks strategically placed in the compound. In fact he had to permanently lock a particular window which assured him of fresh air from the backyard to mitigate the effect of the stench from soakaways. It later deteriorated to a point that Yunusa was always forced to vacate his house whenever a neighbour occupying the upper apartment used the restroom. “The odour was from the pit of hell. It’s indescribable. The smell could reduce your lifespan by at least 9 years. I had to appeal to the caretaker to come to my rescue during the general renovation of the house which he swiftly did to my surprise. It was like a divine intervention” Yunusa recounted to this journalist. As at the time of filing this report, there was a ‘talkative’ well-stretched gutter around the windows of Yunusa’s apartment and it did a good job interfering in conversations at irregular intervals. “I was enjoying my Friday night/Saturday morning sleep when this heavy downpour started in the midnight. In excitement, I wrapped myself in my duvet and accelerated the sleep to relish the cold weather. It was unknown to me that rain water crept into my kitchen and my bathroom after flooding the entire compound and street” Yunusa revealed showing this reporter some dated pictures on his smartphone. His new 32 inches flat-screen TV, home theatre and Cable TV were not spared from the leaking roof which he never noticed. His household electronics started malfunctioning till he had to sun-dry them. Yunusa who claimed to be demoralized lifted several buckets of water from his kitchen and bathroom. Emmanuel only expressed his sympathy on phone over the inconvenience and nothing substantial was ever done. “When I strolled out to estimate the extent of the flood in the street, I noticed some men were already rocking black rain boots. It was like a norm here. Nobody complained but me. My worst fears were confirmed. I had to follow the path of a particular man and walked in the flood dangerously as I needed to reach the market” Yunusa added in a sad tone. Yunusa felt scammed, he revealed he called a lawyer friend who told him the Nigerian law in such a scenario protects landlords owing to the reason why victims of the Lekki Flood of June, 2017 had to solely bear the losses without any litigation. “Next time bro, don’t rent apartments downstairs in Lagos. Only novices do that because the water level could be unpredictable. Take heart man. You need to be strong at this point” the legal practitioner consoled him. One of the challenges some tenants had to deal with was sharing the same electricity pre-paid meters with close neighbours. Equal amounts of monies were paid at the end of the month by the sharing parties when consumption of power ranging from use of appliances, length of time spent at home and others varied. Only a tenant had access to the meter thereby creating an avenue for corruption and manipulation. Investigations conducted by this journalist proved that three different tenants were accused of siphoning monies budgeted for power and not buying the required amount to last the apartments through the month. Yunusa whose only heavy appliance was an electric iron which he seldom used bought 152.6 Kwh units of power worth N4,000 - with his neighbour named Emeka who was suspected to be buying just N1,000 of power – 44.7 Kwh and pocketing the rest over a period of 5 months till Yunusa woke up from his slumber. The implication was that he wasn’t only paying Emeka’s power bills for 5 months, but was also magnanimous enough to be fuelling his car with N1,000. “I was very stupid to trust Emeka. He appealed to me as a gentleman smartly working as a nurse with nice Honda ‘End of Discussion’ to cruise around town. I never knew he could pull such dirty stunts.” Yunusa lamented. A female neighbour and close friend of Yunusa named Fatima had earlier alerted him about the electricity scam in the compound which she felt he was also a victim of. She was shocked to hear that N4,000 worth of power never lasted Yunusa and Emeka for a whole month knowing fully well that both parties spent most of the time at work. “You are being scammed just like Mama Yinka has been extorting money from me. The biggest houses where with all the basic and power-consuming household appliances like Air Conditioners, electric irons, cooking machines and the rest only purchase N2,000 worth of power per month and it lasts them up to 6 weeks in some occasions” she revealed. Emeka was later exposed and the meter was relocated to Yunusa’s apartment with measures put in place to ensure accountability and transparency in paying power bills. Mama Yinka as at press time was still in the habit of cheating Fatima through the power bill loophole. The diminutive woman of the Yoruba tribe who is a staunch member of the Redeemed Christian Church of God appears unrepentant as she steps on toes with laughter and valour. She is a full time house-wife who is into fashion designing. She was in charge of water supply in the compound by virtue of the location of the pumping machine. The tenants paid N500 per month to her to recharge the separate meter used for pumping the water to the available tanks. Reports gathered by this journalist showed that the ever-smiling woman with tribal marks and big cheeks illegally made a connection that allowed her use the meter card to steadily iron clothes without the knowledge of the concerned tenants. Other tenants now cope with paying more to ensure regular supply. It has been also rumoured that Mama Yinka never buys the exact Kilowatts she declares with some funds corruptly kept back for her personal use. In the heat of an argument, Yunusa was told Mama Tope once bragged before the caretaker, Emmanuel about her illegal connection and Emmanuel did nothing. What a brazen display of confidence! 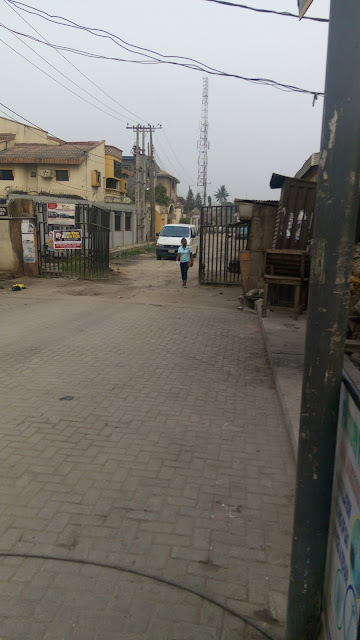 A single Togolese lady in the compound staying in a one-bedroomed apartment has been enduring skirmishes with her neighbour over the power issue. Despite the bitterness, the concerned parties wear fake smiles whenever they encounter their supposed opponents in public places. Emmanuel has overtime proven to be a clueless caretaker who carefully takes note of the challenges faced by tenants but boldly does nothing. He is known to parade a seeming fake legal practitioner who speaks with no intellectual depth. The last time Yunusa heard from him was in November, 2017 when he dropped a letter informing him that his house rent would expire on the 14th of July, 2018. It was obvious Emmanuel was all about the money and not the delivery of satisfactory services. Every tenant in the house has an odd experience to share about Emmanuel but he doesn’t care as long as he could walk freely without being harmed. Yunusa is also eagerly waiting for the fateful day he will pleasurably slide into her after several failed attempts. Fayti has a penchant for walking around braless and pantless. Some married women in the compound who know the randy nature of their husbands have been expressing worries about her mode of dressing but she doesn’t care. The closeness she shares with Yunusa affords her to opportunity to sleep in his house on some occasions. Although, Yunusa’s hands have toured the nooks and crannies of her sumptuous body, he is yet to given a visa into her federal capital for undefined reasons. “At times, I wish I could just pack out of this apartment to a better place but the sight of Fayti’s alluring curves begs me to stay for one more day” Yunusa joked. There is a common saying in Lagos State the only time you might be close to having a perfect accommodation is when you build your own house. Yunusa has braced up for the challenge for many years to come because no matter how loud he complains, nobody will listen as people are also dealing with theirs privately.